I had a plan to get some cool-season vegetables started early this year, but right around the time I was getting ready to plant lettuce seeds, I noticed tiny seedlings of camomile in the raised bed. 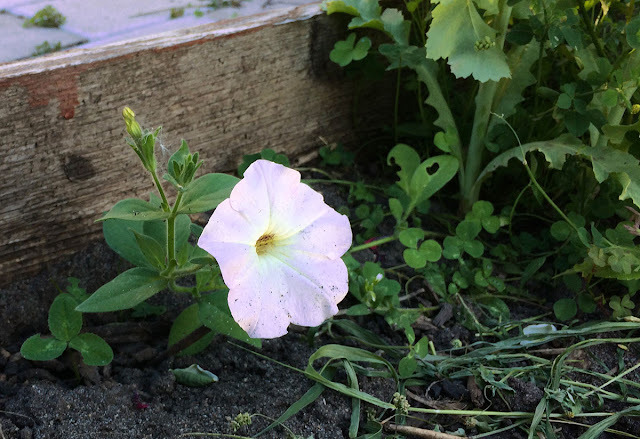 It has grown in this part of my garden the last few summers, and I decided to let them get a little bigger so I could transplant them to a spot next to the fence, thus delaying my salad planting. When I transplanted a few of the camomile as I had planned, I noticed the distinctive gray-green leaves of poppies in the same bed. 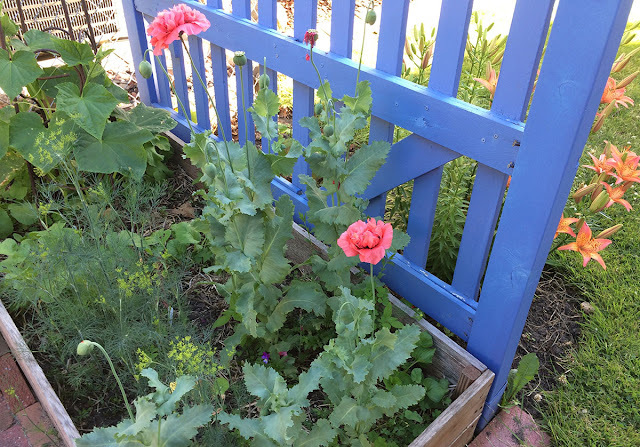 Poppies, with their delicate tap roots, do not care to be transplanted, so I just gave up on the early salad garden idea and let these volunteers have their chosen garden spot. I did eventually clear space along one side of the box to plant a row of beans in June, which are coming along very nicely and don't seem to mind sharing their bed with these pretty companions. Camomile and other flowering herbs tend to attract beneficial insects, so having a few of them scattered around the garden is a good thing anyway. At the same time, I remembered that dill has grown in another of these boxed beds, so I waited for that to sprout, planting cucumbers and radishes at one end. And soon I noticed a few more poppies amid the dill. Now I have this cheery mix of volunteers in the cucumber bed, including a few small purple violas. 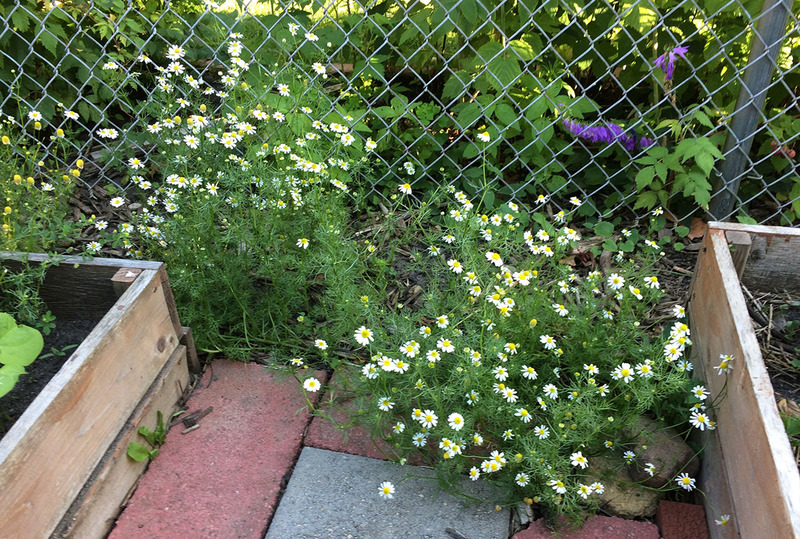 I planted the camomile and the dill a few years ago and haven't had to plant them again since. But the poppies have introduced themselves, I never planted them. My neighbor has some also, and she alerted me to their presence in both of our gardens a few years ago. But hers are frillier and a paler pink, which is funny, because I've had both the frilly pink ones and these deeper salmon colored ones, and I like the salmon ones better. I had decided that when they bloom this year, I would pick the frilly pink ones to keep them from reseeding. But I'm getting only the kind I like this summer. Maybe I did that last year and forgot! 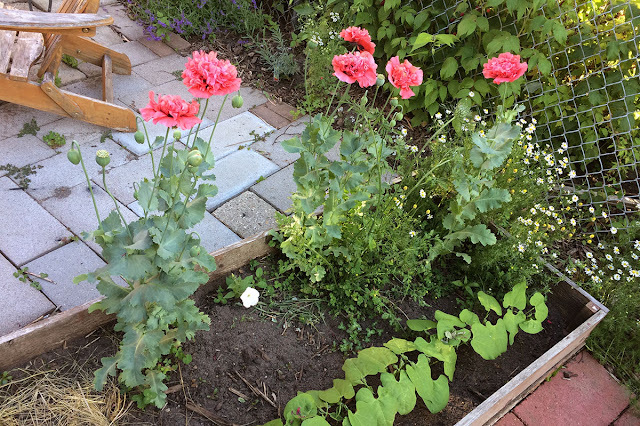 I did a little research online and have learned that these (both varieties) are bread seed poppies, so I'll save some of the seeds to use in cooking. 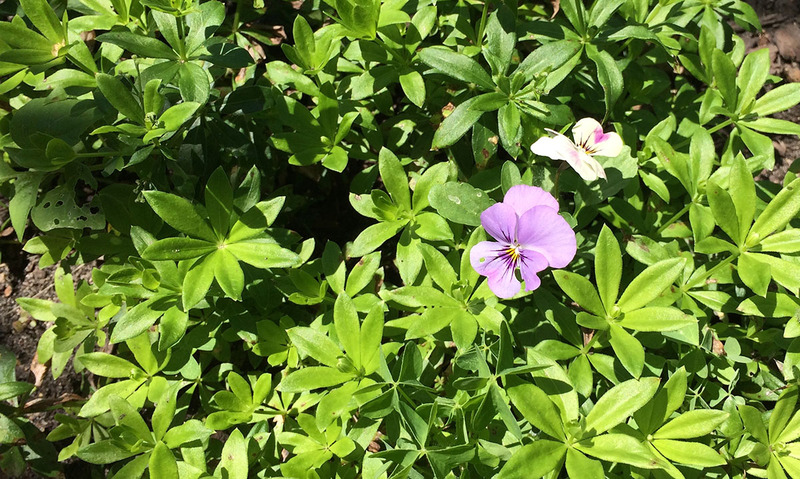 I have planted the sweet little blue-purple violas known as Johnny jump-ups, and now they show up around the patio and elsewhere, but this volunteer violet or small pansy in the midst of the sweet woodruff in my front yard is a little bit of a mystery. I'm enjoying all these volunteers; it's rather fun discovering them and just letting them grow. 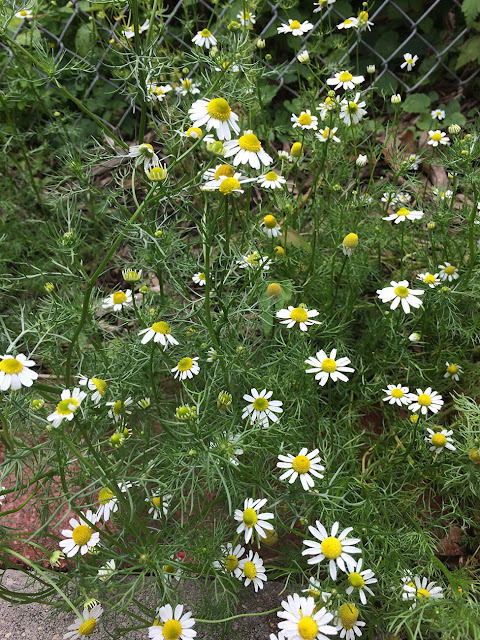 I'll thin them out from time to time, and I've been harvesting the camomile blossoms a few times, which seems to prolong their blooming period. If you just leave the camomile and let them all go to seed, the plant finishes its life cycle and dies back in a few short weeks and becomes rather unsightly. But this summer, I'm finding that the more I pick them, the more they bloom.